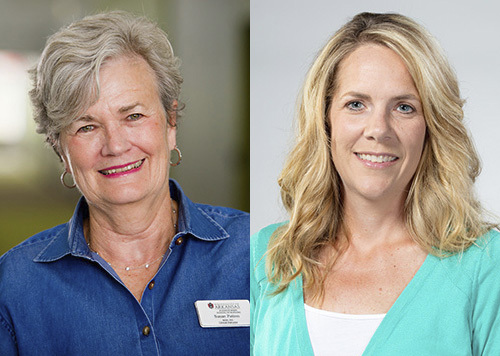 Susan Patton, who has taught in the Eleanor Mann School of Nursing at the University of Arkansas since 2010, has been named interim director of the school. Patton’s appointment was effective Aug. 14. Lori Murray, a clinical assistant professor of nursing, is the new assistant director for undergraduate studies, taking over the position formerly held by Patton. Former director Julie Hoff has taken a director’s position at Texas A&M University-Corpus Christi. Patton holds a doctorate in community health promotion from the U of A and is a licensed advanced practice registered nurse, a certified clinical nurse specialist and a certified nurse educator. She also holds a master’s degree in nursing from the U of A, a master’s degree in health services administration from the University of Arkansas at Little Rock and a bachelor’s degree in nursing from the University of Arkansas for Medical Sciences. Patton worked in leadership positions in the health-care industry for several years, most recently as director of clinic operations for Northwest Health Systems and the Schmieding Center for Senior Health in Springdale and as chief operating officer for Austin (Texas) Regional Clinic. Patton’s research focuses on preventing fall injuries among the elderly. Murray holds a Doctor of Nursing Practice degree from the University of Kansas Medical Center and master’s and bachelor’s degrees in nursing from the University of Oklahoma Health Sciences Center. Before she began teaching at the U of A in 2015, Murray worked in management roles at the Jack C. Montgomery VA Medical Center in Muskogee, Oklahoma, and she taught at Northeastern State University in Muskogee. She also worked as a registered nurse and in RN supervisory roles in several medical settings. She is board certified in gerontology. Murray’s research focuses on patient-centered communication. The Eleanor Mann School of Nursing offers a Doctor of Nursing Practice online, a Master of Science in Nursing online and an R.N. to B.S.N. degree-completion program online as well as an on-campus Bachelor of Science in Nursing degree. The nursing school is located in the Epley Center for Health Professions, a facility that opened in 2012 with five high-fidelity simulation labs in which mannequins simulate patient conditions and offer scenarios for nursing students to address. Last fall, the school enrolled 620 students in the bachelor’s degree program and another 942 students in pre-nursing. The Master of Science in Nursing program had 11 students. The Doctor of Nursing Practice program had 83 students. The degree programs are accredited by the Commission on Collegiate Nursing Education and the Arkansas State Board of Nursing.